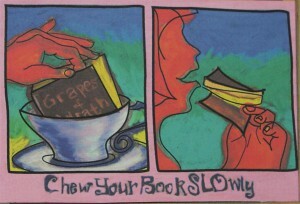 The Special Collections department of Cal Poly’s Kennedy Library is taking a bite out of illiteracy by sponsoring an edible-book arts exhibit, “Chew Your Book SLOwly,” April 1 at Linnaea’s Cafe in San Luis Obispo. The public event, from 4 to 6 p.m., will showcase a wide variety of book art, produced in both unconventional and unusual formats, according to the library’s Catherine Trujillo. 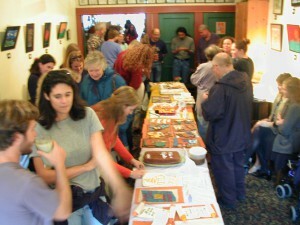 The exhibit is a compilation of visual, culinary and book arts, and all entries are edible. The 3rd Annual International Edible Book Festival is designed to promote literacy by bringing the written word and art together in an alternative medium, said Trujillo. “This epicurean event will be celebrated simultaneously throughout the world, with the palatable potpourri of books exhibited and consumed by those in attendance. The festival, initiated by author Judith A. Hoffberg in 1999, has become an international event through artist Béatrice Coron’s Books2EatWebsite. Artists of all levels who would like to participate by authoring a book in an entirely edible medium should contact Catherine Trujillo by March 20 at 805-756-6395 or ude.yloplacnull@llijurtc. All works of art must be edible, relate in some way to books, and be at Linnaea’s, 1110 Garden St., by 3 p.m. prepared and ready for installation. “Chew Your Book SLOwly” is being presented in partnership with the San Luis Obispo County Arts Council and the San Luis Obispo Literacy Council. We are closed. Come back Friday at 7:00am. Hooray, Friday! It's 3:54am right now.